We’ve used snack nori – but you can also use regular nori and make it crispy yourself by holding it over fire very shortly. COMBINE grated ginger, brown caster sugar, 30 ml mirin, 50 ml soy sauce and 1 tablespoon sesame oil to create a teriyaki marinade. CHOP the beef steaks into pieces and marinade for at least half an hour, the longer it will marinade the tastier the beef will be. COOK the rice according to the package of the rice of your choice. Meanwhile FILL a second medium-sized bowl with water and salt and bring to a boil. DIVIDE the broccoli into florets and if needed also clean the sugar snaps. COOK the broccoli and sugar snaps seperate for a few minutes. REMOVE the seeds from the bell pepper and red chili pepper. Chop the bell pepper into thin strips and the chili pepper into thin rings. 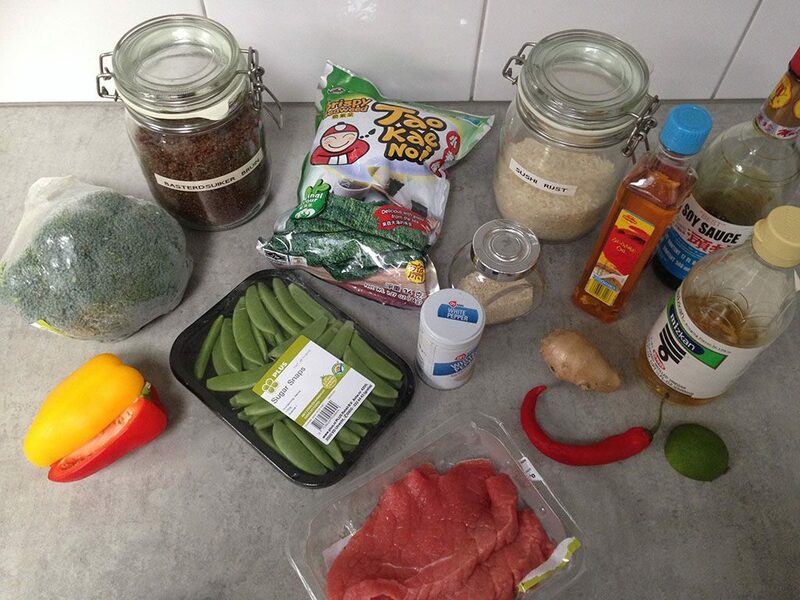 DRAIN the rice and combine with juice of half a lime and 70 ml mirin. SEASON with white pepper and set aside. HEAT oil in a medium-sized skillet and cook the bell pepper for about a minute. Then ADD the marinated beef and cook for a few minutes more. 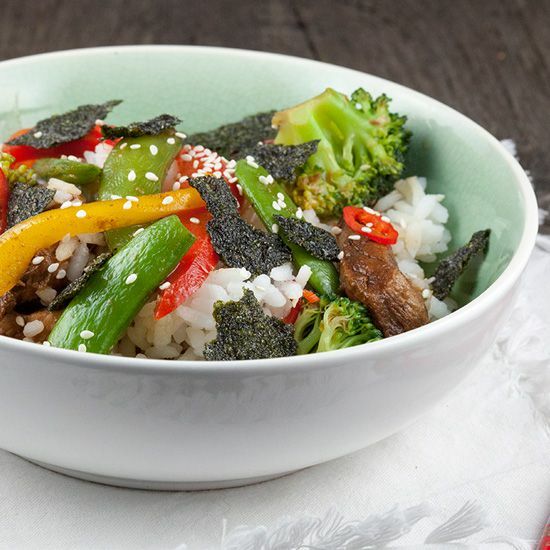 DIVIDE the rice over 4 bowls and divide the broccoli, sugar snaps, beef and bell pepper over the rice. 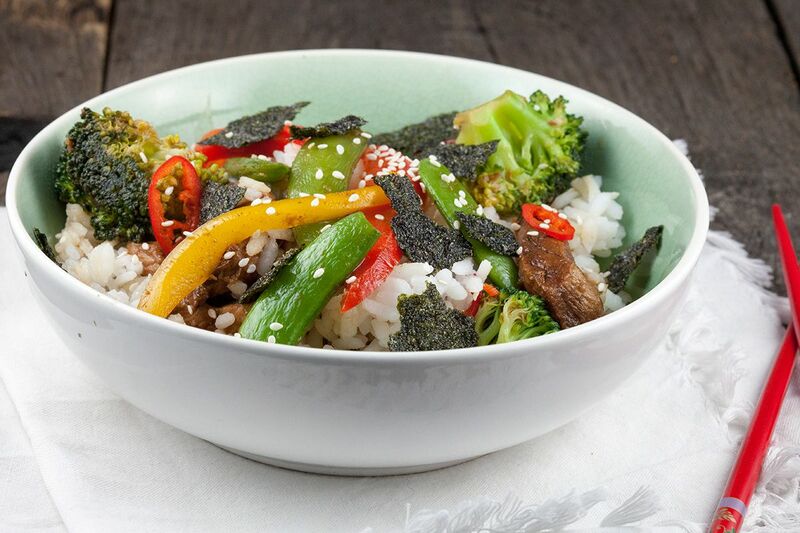 Finish it off with sesame seeds, red chili pepper slices and (crispy) seaweed pieces. 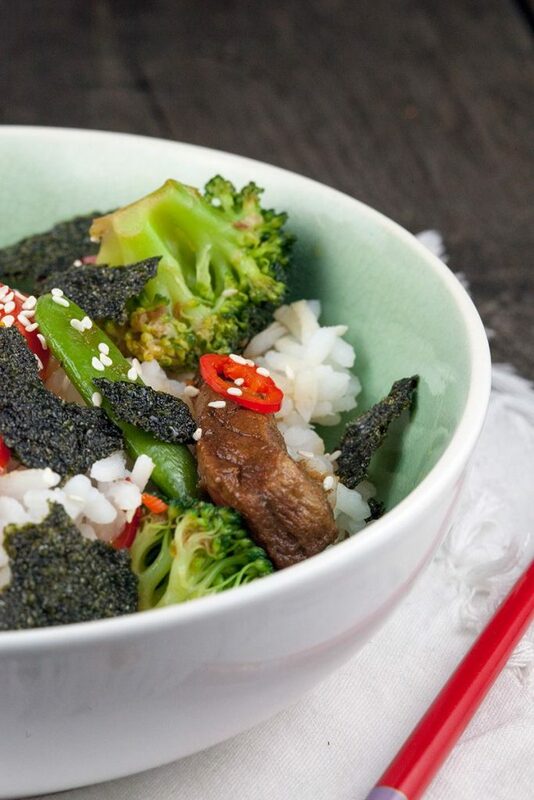 This sushi bowl can be eaten hot, lukewarm and cold. Enjoy! Great idea for a sushi rice bowl.